Powers/Abilities: None in her first version, and apparently none in her last version. Her voice seemed molasses stuffed with honey. In the second version she had a module that neutralized the mutant genetic structures, rendering non-operative some basic sub-structures of the DNA. Its range was uncertain, probably 1-2 kilometers, and passed through solid walls of rock and panels of steel. She had a special radar to perceive the presence of the mutants around her; the radar didn't "read" the normal humans. Nanny had also an energy "blast" that she used to punish the children who disobeyed her. 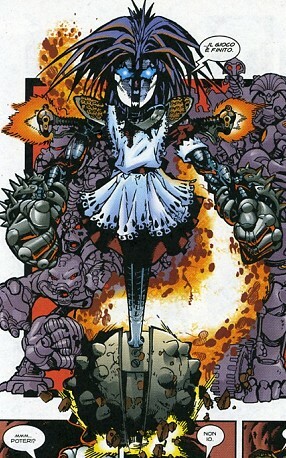 Nanny had also a "battle-mode" appearance: the lower wheel transformed in a big spiked spherical wheel crackling with energy, her arms enlarged and acquired spiked forearms, her eyes glowed blue. She probably had total control about the robots and ani-cyborgs of the base. (Uncanny X-Men I#112 (fb) - BTS) - Magneto created Nanny as instrument of revenge against the X-Men. He placed Nanny in one of his secret bases, on the Barrier of Filchner in Antarctica. (Uncanny X-Men I#112) - Magneto kidnapped the X-Men (Banshee, Beast, Colossus, Cyclops, Nightcrawler Phoenix, Storm, Wolverine) and transported them to the Antarctic base. Magneto battled and defeated the X-Men, then imprisoned them in special chairs that cancelled their powers and scrambled their nervous system, so that their motor coordination and speech were as reduced as a 6 months baby's. Nanny had the task to attend to them in the sweetest way. (Uncanny X-Men I#113) - For weeks the lives of the X-Men depended from Nanny. "She" fed them, washed them, cured them, read them novels, running to them when they whimpered or cried. (Uncanny X-Men I#113 - BTS) - Storm succeeded in picklocking her chair, liberating the X-Men, and together they incapacitated Nanny. (Uncanny X-Men I#113) - The X-Men used Nanny as bait. Magneto went back to the Antarctic base and discovered Nanny, damaged, then started a hard battle that caused magma to flood the base, destroying it and Nanny, too. (Uncanny X-Men #149) - Searching for clues on the whereabouts of Magneto, the X-Men (including new member Kitty Pryde) returned to the Antarctic base and found Nanny's severed head. Nightcrawler held it in his hands and made a joking reference to Hamlet, "Alas, poor Nanny. I knew her, Horatio. A robot of infinite jest." Wolverine had no sympathy left for Nanny and clawed the head into pieces. (Uncanny X-Men I#347 - BTS) - Magneto rebuilt Nanny and the Antarctic base. Nanny was programmed to never let the mutants go away from the base. (Uncanny X-Men I#347) - Some X-Men (Gambit, Joseph, Rogue) came back on the Earth from a mission in space and arrived in Antarctica. Gambit, captured by Spat and Grovel, met Joseph and Rogue (who had captured Landscape). Then walking in the caverns under the surface, they met Nanny and some robots. (Uncanny X-Men I#348) - Nanny neutralized the mutant powers of Joseph and the other men. The robots captured them and put them to "sleep". Trish Tilby, unseen by Nanny, followed them. Nanny cared for Joseph; she believed he was Magneto, but when Joseph ordered to release him she denied, because of her programming. She let Joseph watch on TV the latest developments about Operation: Zero Tolerance. She considered the mutant situation too dangerous to let him go out. However, unseen by Joseph, she doubted some moments about Joseph real identity. The Beast traveled to the base through the underground tunnels and recognized the base where the X-Men defeated Nanny for the first time. Some robots found him. Nanny punished Gambit and Rogue with an energy charge because they were not still sleeping. (Uncanny X-Men I#349 - BTS) - Joseph managed to escape form his cell . (Uncanny X-Men I#349) - Joseph freed also Gambit, Rogue, Spat and Grovel and tried to go away through the underground passages but they were intercepted by Nanny and her robots. Nanny wanted to punish their "children" and transformed herself into "battle-mode;" but she was unable to perceive Trish Tilby with her radar. Trish sneakily smashed Nanny's head with a crowbar, deactivating Nanny. Gambit charged the head with his powers and threw it far away, where it exploded. The mutants reacquired their powers. 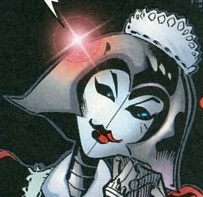 (Uncanny X-Men I#350) - Nanny's head was used by the Beast to perform some Shakespeare's verses. (Secret Avengers I#36) - Alongside many other robots and androids, some believed destroyed, others unknown, Nanny was a proud member of the Descendants, a form of mechanical life, and stayed hidden for years in the their subterran capital town. When the Descendants knew that the first baby was naturally born from a mechanical life-form, they set in motion their plan to convert all the humanity into descendants. Nanny had the task to care the child, Parvez, but secret Avengers attacked the base: Black Widow, Venom and Valkyrie. Venom webbed Nanny's face and neutralized her. (Secret Avengers I#37 - BTS) - The Human Torch destroyed the Orb of Necromancy, neutralizing the nanovirus which was transforming humans in mechanic beings. All the Descendants died. Comments: Created by Chris Claremont, John Byrne and Terry Austin. In Uncanny X-Men I#348 a bat-cyborg seemed to have watched Trish Tilby for a long time, but neither it nor Nanny took any action to capture her. 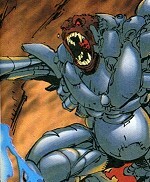 In Uncanny X-Men I#349 the Beast is seen being approached from behind by two robots. The Beast didn't mention it when he met Trish Tilby, after, when he explained tp her why he had reverted to his human form. These two events drive me to think that the robots and/or Nanny left the Beast and Tilby free to act and help the other mutants escape (or Lobdell, Madureira and Bachalo didn't do a good work in storytelling). In Uncanny X-Men I#350, the X-Men met Erik the Red/Magneto and some robots of him. I suppose that Nanny and her Ani-Cyborgs were also re-built and built by Magneto. Nanny was helped by a little force of robots and ani-cyborgs. Many robots had a barely human form. Some of them seemed to be animals whose arms or eyes or body parts had been replaced by cybernetic parts. There were more than 15 members, and probably many more. One of them had a extensible arm and a very big hand. Another one had a shotgun instead of the forearm. One of them seemed capable of levitating. Another one was a bat with bionic eyes (probably cameras); it spied Trish Tilby. They probably were fully dependant on Nanny, because after Trish Tilby smashed and deactivated Nanny, the robots took no action against the X-Men.